Benito Pablo Juárez García (March 21, 1806 – July 18, 1872) was a Zapotec Amerindian who served five terms (1858–1861), (1861–1865), (1865–1867), (1867–1871), and (1871–1872), as President of Mexico.For resisting the French occupation, overthrowing the Empire, and restoring the Republic, as well as his efforts to modernize the country, Juárez is often regarded as Mexico's greatest and most beloved leader. He is the only full-blooded indigenous national to serve as President of Mexico, a not inconsequential achievement in a nation where the rights of the indigenous people have tended to be a low priority. He is mainly remembered for his radical reformist spirit, for his dedication to democracy and to securing equal rights for indigenous people, as well as for lessening the power the Roman Catholic Church held over Mexican politics. The period of his leadership is known in Mexican history as La Reforma (the reform), and constituted a liberal political and social revolution. These reforms brought major institutional consequences such as the expropriation of church lands, bringing the army under civilian control, and liquidation of peasant communal land holdings  and adoption of a federalist constitution. Juárez was born in the small village of San Pablo Guelatao, Oaxaca to indigenous parents. His parents were peasants who died when he was three. He worked in the corn fields and as a shepherd until the age of 12. On December 17, 1818, he walked to the city of Oaxaca looking to educate himself and find a better life. At the time he was illiterate and could not speak Spanish, only Zapotec. In the city he had a sister who worked as a cook and there, he took a job as a domestic servant and eagerly made up for his lack of education. A lay Franciscan, Antonio Salanueva, was impressed with young Benito's intelligence and thirst for learning, and arranged for his placement at the city's seminary. He studied there but decided to pursue law rather than the priesthood. He graduated from the seminary in 1827 and went on to get a law degree at the Instituto de Ciencias y Artes. Faced with growing opposition, Santa Anna resigned in 1855 and Juárez returned to Mexico. The liberales (liberals) formed a provisional government under Juan Álvarez, inaugurating the period known as La Reforma. The Reform laws sponsored by the puro (pure) wing of the Liberal Party curtailed the power of the Catholic Church and the military, while trying to create a modern civil society and capitalist economy on the North American model. The Ley Juárez (Juarez's Law) of 1855, for example, abolished special clerical and military privileges, and declared all citizens equal before the law. In 1857 the liberals promulgated a new federalist constitution. Juárez became Chief Justice and Vice-President of Mexico, under moderado (moderate) president Ignacio Comonfort. The conservadores (conservatives) led by General Félix Zuloaga, with the backing of the military and the clergy, launched a revolt under the Plan of Tacubaya in December 1857. Juárez was arrested, but escaped to lead the liberal side in the Mexican War of the Reform, first from Querétaro and later from Veracruz. In 1859, Juárez took the radical step of declaring the confiscation of church properties. In spite of the conservatives' initial military advantage, the liberals, drawing on support of regionalist forces, turned the tide in 1860 and recaptured Mexico City in January 1861. Juárez was elected President in March for another four-year term, under the Constitution of 1857. Faced with bankruptcy and a war-ravaged economy, Juárez declared a moratorium on foreign debt payments. Spain, Great Britain, and France reacted with a joint seizure of the Veracruz customs house in December 1861. Spain and Britain soon withdrew, but the French Emperor Napoleon III used the episode as a pretext to launch the French intervention in Mexico in 1862, with plans to establish a conservative regime. The Mexicans won an initial victory over the French at Puebla in 1862, celebrated annually as Cinco de Mayo (May 5). The French advanced again in 1863, forcing Juárez and his elected government to retreat to the arid northern city of Chihuahua. Meanwhile Maximilian von Hapsburg, a younger brother of the Emperor of Austria, was proclaimed Emperor Maximilian I of Mexico on April 10, 1864 with the backing of Napoleon III and a group of Mexican conservatives. Before Juárez fled, Congress granted him an emergency extension of his presidency, which came into effect from 1865, when his term expired, until 1867, when the last of Maximilian's forces were defeated. In response to the French intervention and the elevation of Maximilian, Juarez sent General Plácido Vega y Daza to California to gather Mexican American sympathy for Mexico's plight. Maximilian, who personally harbored liberal and Mexican nationalist sympathies, offered Juárez amnesty, and later the post of prime minister, but Juárez refused to accept either a monarchy or a government imposed by foreigners. With its own civil war over, the United States invoked the Monroe Doctrine to give diplomatic recognition to Juárez' government-in-exile and supply weapons and funding to the Republican forces. Faced with this and a growing threat from Prussia, the French troops began pulling out of Mexico in late 1866. Mexican conservatism was a spent force and was less than pleased with the liberal Maximilian. In 1867 the last of the Emperor's forces were defeated and Maximilian was sentenced to death by a military court. Despite national and international pleas for amnesty, Juárez refused to commute the sentence, and Maximilian was executed by firing squad on June 19, his body was returned to Europe for burial. Juárez was controversially re-elected President in 1867 and 1871, using the office of the presidency to ensure electoral success and suppressing revolts by opponents like Porfirio Díaz. 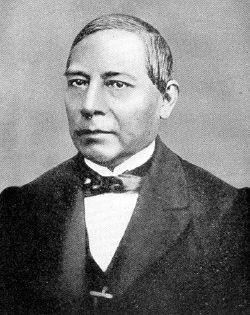 Benito Juárez died of a heart attack in 1872 while working at his desk in the National Palace in Mexico City. He was succeeded by Sebastián Lerdo de Tejada, his foreign minister. Benito Juárez park monument in Houston, Texas, U.S..
Juárez's famous quotation continues to be well-remembered in Mexico: Entre los individuos, como entre las naciones, el respeto al derecho ajeno es la paz, meaning "Among individuals, as among nations, respect for the rights of others is peace." It is inscribed on the coat of arms of Oaxaca. "You assure me that you have no doubt that if I accept this meeting, the peace and happiness of the Mexican nation will result from it, and that the Empire will reserve for me a distinguished position, seeking the help of my talents and patriotism. Certainly, sir, the history of our times registers the name of great traitors who have violated their oaths, their word and their promises; they have betrayed their own party, their principles, their ancestors and everything an honorable man holds sacred. Furthermore, in all these cases, the traitor has been guided by a vile ambition of power and a miserable desire to satisfy his own passions and even his own vices. However, the man currently in charge of the presidency of the Republic, a man that came out of the dark masses of the common people, will succumb - if such is the design of Providence - after fulfilling his duty until the end, in accordance with the trust of the nation that he presides over and having satisfied the requirements of his own conscience. I must conclude due to my lack of time, but I will add a last observation. It is given to men, sometimes, to attack the rights of others, to seize their goods, to threaten the life of those who defend their nation, to make the highest virtues seem crimes, and to give their own vices the luster of true virtue. But there is one thing that cannot be influenced either by falsification or betrayal, namely the tremendous verdict of history. It is she who will judge us." Today Benito Juarez is remembered as being a reformer dedicated to bringing his country a greater degree of democracy, equal rights for the nation's indigenous Indian population, lessening the great power that the Roman Catholic Church then held over Mexican politics, and defense of national sovereignty. The period of his leadership is known in Mexican history as La Reforma (the reform), and constituted a liberal political and social revolution with major institutional consequences: the expropriation of church lands, bringing the army under civilian control, liquidation of peasant communal land holdings, and adoption of a federalist constitution. La Reforma represented the triumph of Mexico's liberal, federalist, anti-clerical, and pro-capitalist forces over the conservative, centralist, corporatist, and theocratic elements that sought to reconstitute a locally-run version of the old colonial system. It replaced a semi-feudal social system with a more market-driven one, but following Juárez's death, the lack of adequate democratization and institutional stability soon led to a return to levels of centralized autocracy and economic exploitation under the regime of Porfirio Díaz that surpassed anything from the colonial or conservative eras. The porfiriato (Porfirist era), in turn, collapsed in the Mexican Revolution. The anniversary of Juárez's birth (March 21) is a national holiday in Mexico (See: Fiestas Patrias (Mexico)). Benito Juárez Mexican Citizen The Congress of 1865 dedicates, in the name of the Colombian people, this homage attesting his fortitude in defending the freedom and independence of México." “…Juárez is the upright statesman that makes a clear contrast with one too many traitors and betrayers; the man of good faith that chooses misery and death to shame, because the word "duty" is more flattering to him than the insignia of Great Marshall; he is the genius that will scare away, no question about it, the horrifying tempest that has blown so recently upon the New World; he is, gentlemen, Senators, the one that is being proposed that you honor through a decree. I would not believe there is a single Colombian Senator that would not want to hurry to support, through his vote, the consacration of such an act, than would honor more us than the immortal Juarez." Italy's Fascist Dictator Benito Mussolini was named after Benito Juarez by his socialist parents. Note that Benito translates to Benedict, and the Italian for Benedict would have been Benedetto. Warner Brothers produced a biographical film about Juarez, simply titled Juarez in 1939, with Paul Muni portraying the leader. American actress Bette Davis appeared in the film, which featured a powerful musical score by Erich Wolfgang Korngold. Juárez has also been played in motion pictures by Jason Robards, Sr. (1940), Fausto Tozzi (1965), Helmut Schellhardt (1988), and Luis Valdez (1994). A great number of cities, towns, streets, institutions, etc., are named after Benito Juárez; see Juárez for a partial list. The United States has statues of Juárez along Sixth Avenue in New York City's Bryant Park; in Washington, DC, across from the Watergate Building; at the "Plaza de las Américas" on North Michigan Avenue in Chicago, Illinois; and on Basin Street in New Orleans, Louisiana. Additional tributes include elementary schools in both Anaheim, California and San Diego, California named after Benito Juárez. In Guatemala, there are monuments to Juárez in Quetzaltenango and Guatemala City. In New Delhi, The Government of India named a major road as Benito Juarez Marg in his memory. The road is home to many institutes of higher education. It has been said that Abraham Lincoln had great sympathy to the Juarista cause. When he could get no support in the U.S. Congress, he supposedly had the Army "lose" some supplies (including rifles) "near" (across) the border with Mexico. 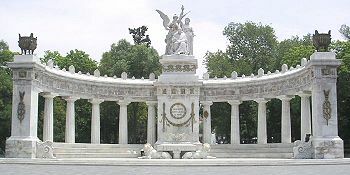 ΦΙΑ – A U.S. university fraternity that takes Benito Juárez as one of its "five pillars"
↑ México - Presidencia de la República, Biografías de los gobernantes de México, Biografías de los gobernantes de México Retrieved November 1, 2007. ↑ Mexicó para niños, Biography of Benito Juárez. History. Mexico, Biography of Benito Juárez Retrieved December 18, 2007. México - Presidencia de la República. Biografías de los gobernantes de México. Biografías de los gobernantes de México Retrieved November 1, 2007. Mexicó para niños. Biography of Benito Juárez. History. Mexico. Biography of Benito Juárez. Retrieved December 18, 2007. This page was last modified on 13 December 2016, at 17:56.